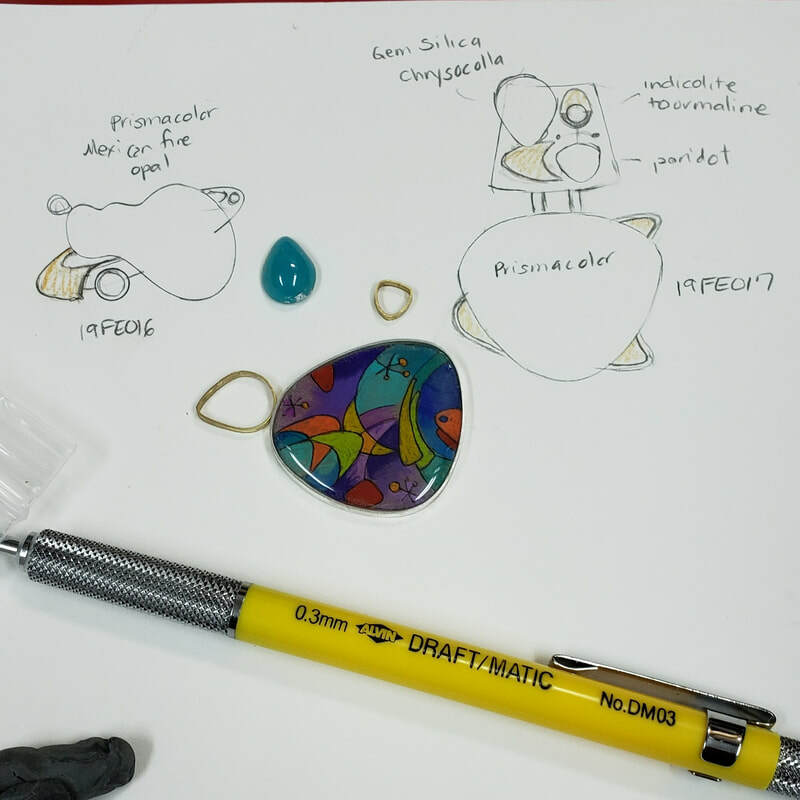 Over the weekend I was busy designing the earrings, pendants, and bracelets which I hope to bring to Arizona and California in a couple of weeks. 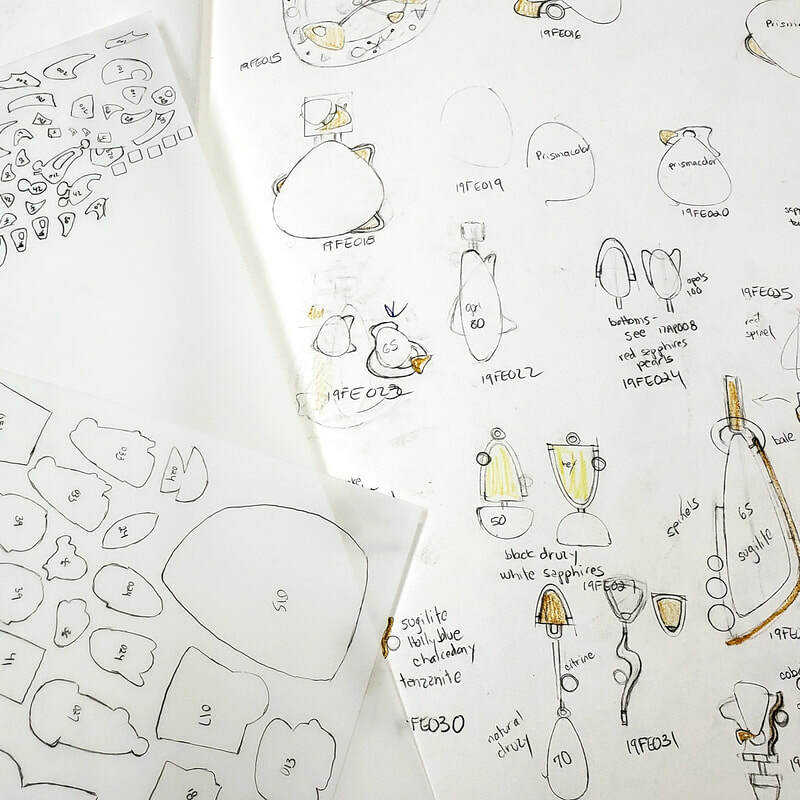 The sketches serve as working drawings. 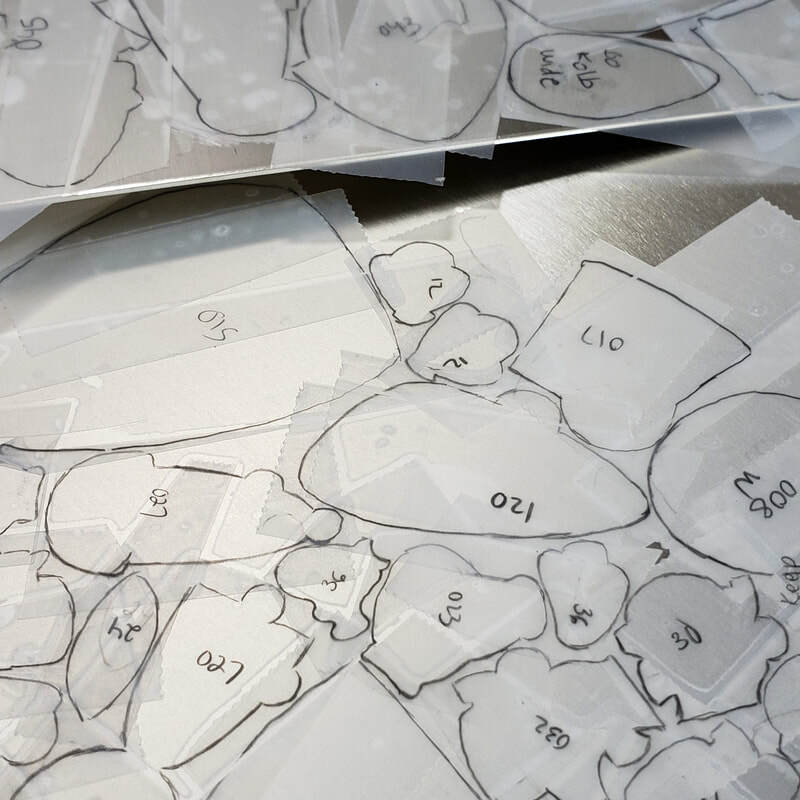 After they are complete, I trace the outline of each component of the piece in graphite on frosted acetate. Next, I "pick" each tracing up with transparent tape and tape it to the sheet metal. I was able to tape down all of the pieces to the sterling silver sheet by 9pm, but still have the more difficult task of laying out the extremely tiny 18k gold trim pieces. The material is expensive, and they need to be fitted carefully to prevent waste. New designs are making their way onto paper, my spring show schedule is starting to take shape, and I'm getting started back on the bench. 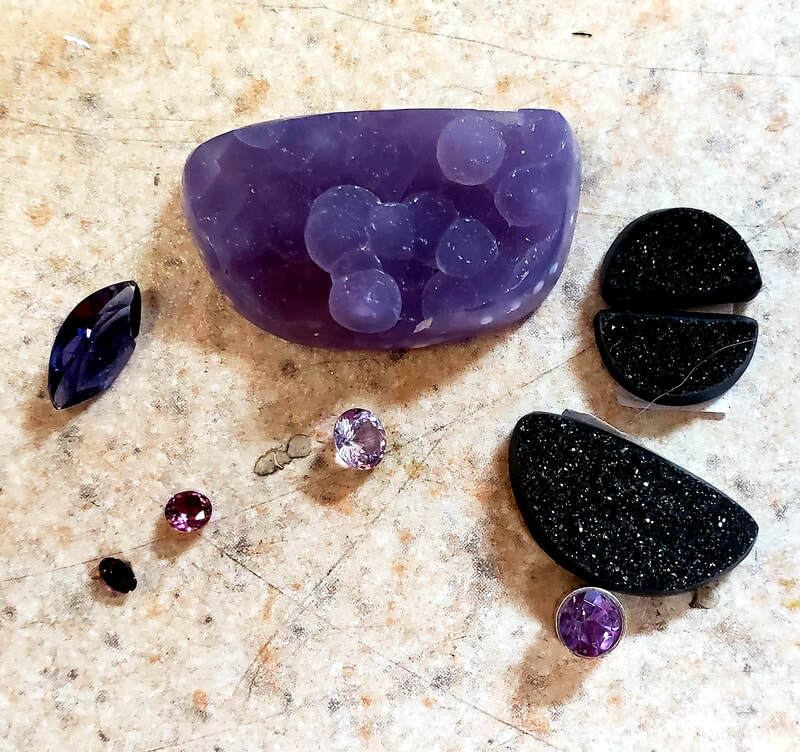 I know many of you are looking for a rare stone to match a piece of mine you already own, or for a stone you just like but have not been able to find. After a few years away, I'll be making my way down to the Tucson Gem show in a couple of weeks. Please send me an email to goldgraphix@gmail.com along with a picture of what you are trying to match, and I'll be sure to look for it. I can even text pictures from the show. My next two shows are in Phoenix (Carefree) the first weekend in March, and in La Quinta, CA on the second. I'll put a more comprehensive schedule up on my show page soon. We lost Mike on December 22nd. After a couple of difficult months, I began to try to heal myself in my studio. I did the La Quinta Art Fair in March, and have been busy making new bracelets, pendants, and earrings for the spring season. I published a few dozen new pieces yesterday, and will get more up in the next week or so. After a Mother's Day trip with family, I'm off to do the Belleville, IL Art in the Square show followed by the Denver Art Festival on Memorial Day weekend. ​Welcome to my new website! I think this will work better for both of us. The site will be easier to use on tablets, phones, and will be easier to run sales, and for you to shop! Many of you have been following me and my husband Mike for the past 30 years or so since I've been doing art shows. We were thrown a curve ball first in 2014 when Mike was diagnosed with a small melanoma, then, ultimately last fall when we found out he was suffering from an extremely rare form of lymphoma. As he has gone from active disease to remission to relapse, it has been harder for me to travel and do art shows. I love what I do, and I am hoping that I can keep going with an internet based business until we are able to travel again. Please share this site with your jewelry loving friends!